The postcard was addressed to Mrs. Frank Richards of Lodi, Wisconsin. The message is "Home and family of John Livingston taken two year ago. Orin by his papa Elmer on the stop (s/b step? stoop?). Kitchen, dining room, Parlor, bedroom, bathroom and closet downstairs. 2 large bedrooms and 2 closets upstairs, storeroom. Apr. 26, 1915"
1. Orin Wesley Livingston b. Aug 21, 1903, Livingston, Grant WI, m. Marjory Dana (she b. abt 1904 and d. Oct 3, 1999); dau. Linda Livingston b. abt 1939. Orin was probably the Livingston Postmaster for many years. Orin died Dec 24, 1959 in Madison WI, age 56. Note: Ruth Fern Livingston b. Aug 9, 1906 d. June 20, 1907. 1910 census in Hellgate, Missoula, Montana has parents John and Julia along with sons Orin and Elmer living with Ed O Wood, age four, b. Missouri as is John Livingston. The four Livingstons are listed as cousins and four year old Ed Wood is Head of the family. 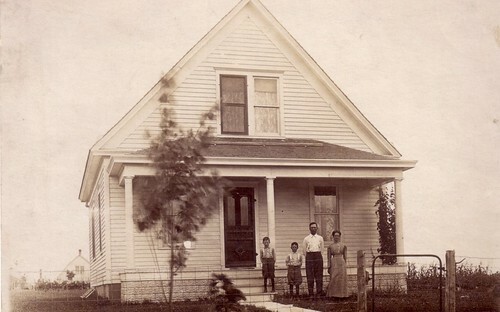 By 1930 all 4 Livingstons are living together in Livingston, Grant, WI. In 1920 all four had been in Clinton, Grant, WI. John Wesley Livingston has a World War I Draft Registration Card for 1917-1918 when he was 40 years old. He was an Engineer with traction engines for Skaife, Rundell and Beddiers (?) Treshing Company in Livingston and vicinity. His wife was Julia Ethel Livingston. Grandfather: Robert Livingston b. abt 1837 in Ireland to Robert Livingston and Mary Watson. m. Esther Quillan [other sources say Quillen] Dec. 24, 1863. She b. Aug 28, 1842 in Oberlin Lorain, Ohio to Alexander John Quillen (b. 1816 in Ohio and d. 1904 in the Old Soldiers Home, Leavensworth Kansas) and Elizabeth Oberlin (b. 1821 in Pennsylvania and d. 1891 in Barton Missouri). Esther was John's second marriage. By 1870 the family was in North Fork, Barton Missouri. the son of Hiram Newell Wood and Alzina Merrett and b. 1840 in Bangor Franklin, NY. 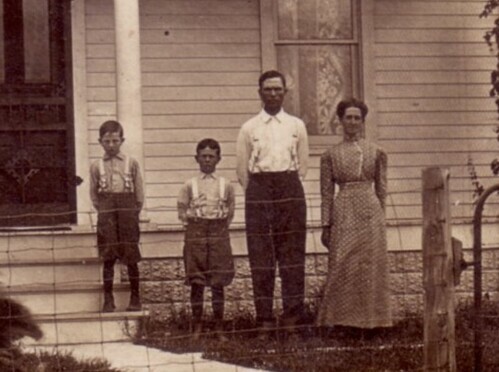 They had 7 children including Edward Orion Wood (1874-1880) who was born and died in Missouri. I would love to know who are the parents of Elizabeth Oberlin. Does anybody have any idea? Any clues would be appreciated. I am a descendent of hers through the and Esther Quillin lineage. Not sure where to go to find this information.